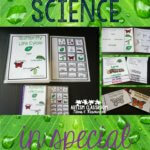 Don’t you love finding great work task materials in the Dollar Store or Spot? Easy to use, already made. Gee, even if they are more than $1 they are great finds! Maybe add a little laminate and Velcro, but otherwise good to go! Such time savers! But sometimes I get so disappointed when I get them home and realize they aren’t as great as I thought they would be. For instance, I found these the other day, each for a dollar, and was so excited because you just laminate them and they would be ready to go! But when I got them home, I realized that they have a few things that are going to mess kids up if I used them as they came in the package. And it made me realize that there are a few mistakes we need to avoid with commercial products (or noncommercial ones too I suppose) in order to make sure that we are 1) practicing the skill we intend and 2) not confusing the students. So I thought I would use these two great little tasks as examples of both the kind of mistakes to avoid as well as how we can adapt the materials to make them useful. 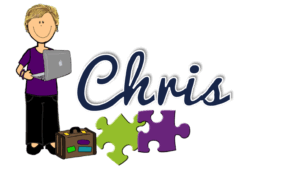 The tasks came with clothespins–so I thought, wow–I don’t even need Velcro! Unfortunately it turns out they each only came with 5 clothespins. For the one with numbers, it came with the odd numbers on one side of the clothespin and the even on the other. Now that might work well for students who are working on odd and even…but for a work system it’s important that the student know when the work is finished. For some individuals it would be difficult to finish a task with empty spaces left on the card, like the picture below. For some students this might be OK because they learn to only add the numbers that match. For others it’s difficult because they might feel it is incomplete. Some ways to solve this problem? Add more clothespins so that there is a complete set. In this case, I used a permanent marker to make the even numbers. Then I wrote over the odd numbers with the black permanent marker so they would match. Then I blacked out the even numbers that were on the other side of the odd-numbered clothespins so the students wouldn’t turn them over and get confused. If I had realized the problem in the store, I could just have bought 2 sets and I would have had a complete set of numbers. However, had I done that I would want to make sure that I blacked out the numbers on one side of the clothespins so the students didn’t get confused. 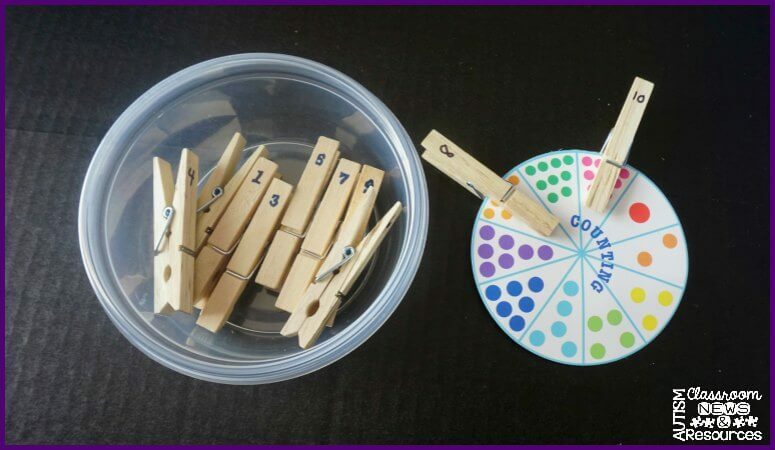 Or I could just make a whole new set of clothespins using a permanent marker or tape to write all the numbers. 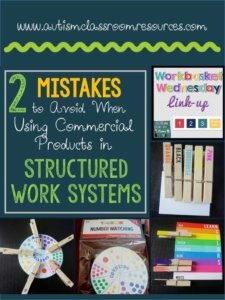 One of the easiest thing to have happen with commercial materials is that there are 2 ways the student could do the task. Many of our students are excellent at finding hidden information and learning the wrong thing–they attend to the wrong element of the task. For instance, in the counting task above, some students will learn to attend only to the color–so the #8 goes with the orange dots–rather than counting. In addition, the numbers in the circle are in numerical order going clockwise. A student who knows how to count can finish the task by putting the clothespins in order rather than actually matching numerals to amounts. That’s fine if you want him to do it independently, as long as you realize it isn’t necessarily practicing matching numbers to sets. In the set above, it looks like (on the left) the student is matching words to colors when in fact he or she might be picking up on the color cues of the words. 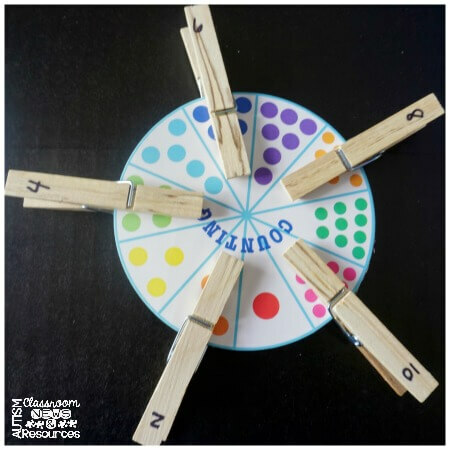 I replaced the clothespins with ones that had just colors on them so the students were matching color to color and not getting confused by the words. I could have also written the words in black on all the clothespins so that there was no color cue if I wanted to keep the word-color matching going. 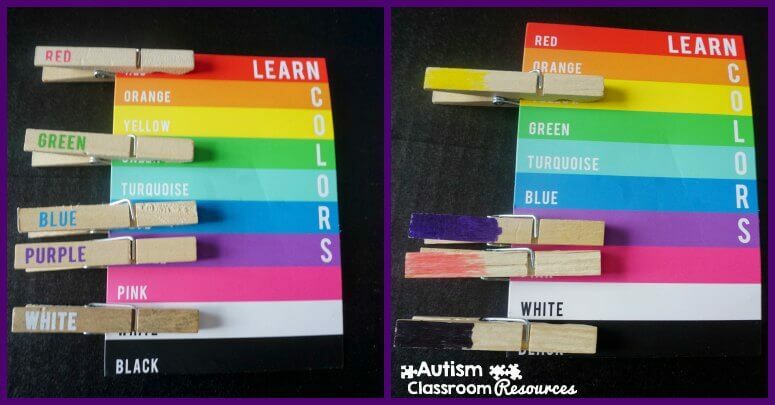 (These cards also came with clothespins with colors written on the front and other colors written on the back, so either way I had to add clothespins to make it a complete task). 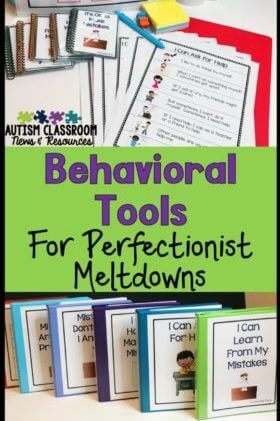 So, having to make some accommodations to the tasks doesn’t mean that they aren’t useful. Similarly, perhaps you have a student who needs to count even numbers and can manage when there are blank spaces. 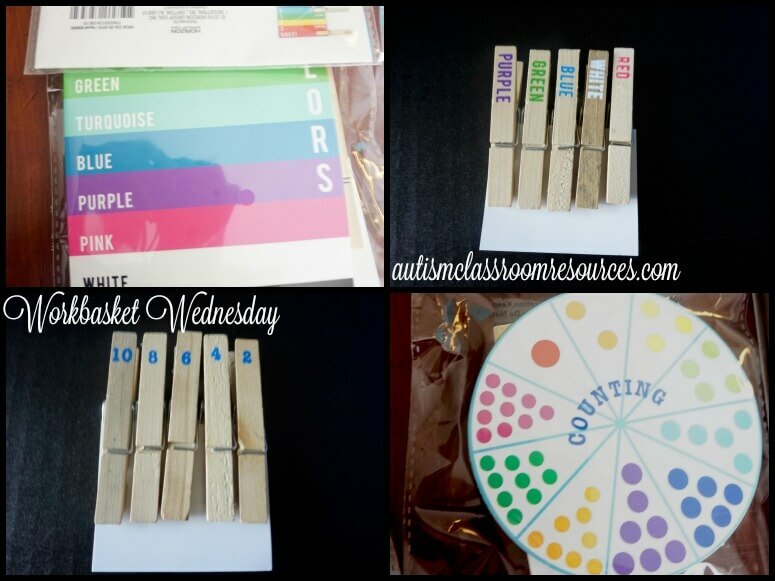 Or perhaps there is a student who benefits from practicing matching colors while looking at the color word at the same time. If that’s the case, then ti will work perfectly for you (once you add to the clothespins). 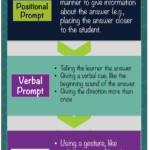 The key is to be aware of what the characteristics of the task are that the students might be attending to. The key is to be aware of what the characteristics of the task are that the students might be attending to and make modifications if needed. Oh yes, and always double check the things you buy in the dollar store / spot before purchasing to make sure they are what you think they are. Sometimes it’s like I become a completely different person there and I am so not thinking clearly–because after all, it’s only $1! Have some workbasket tasks you want to share (they don’t have to be assembly tasks)? 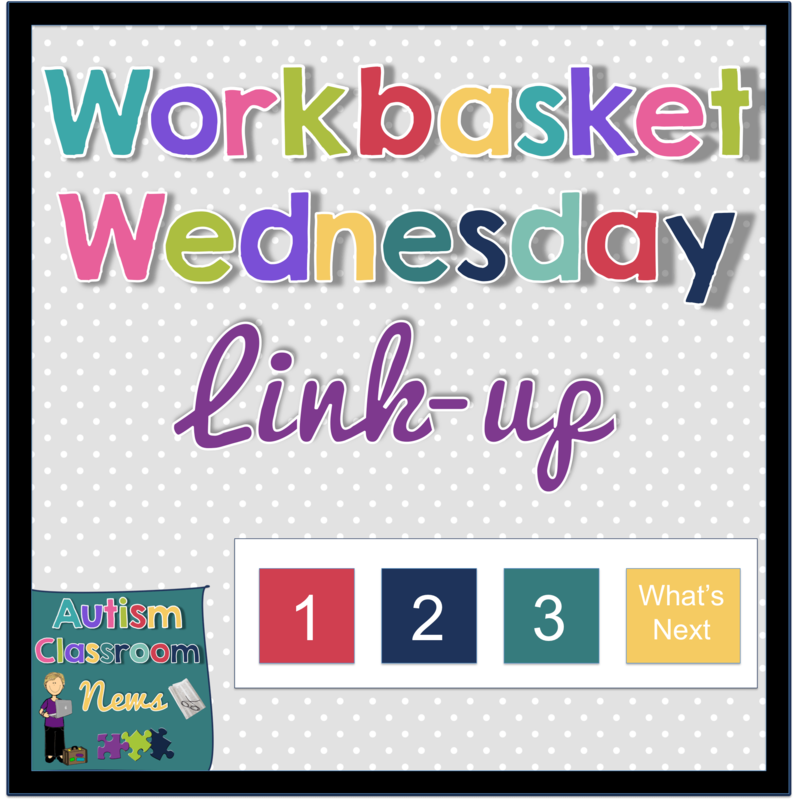 Link up below or share them on social media with #workbasketwednesday and copy me (@reeveautism on Twitter and @autismclassroomnews on Instagram). 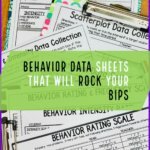 Looking for more ideas on work systems and how they can be used? Check out the links below for more posts. And, I wrote about a book about them! Click on the book to the left for an Amazon Affiliate link (see my disclosure policy for more information about affiliate links). 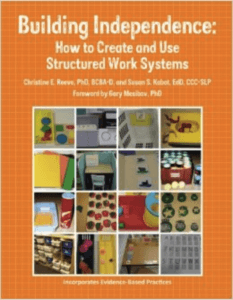 Looking to set up work systems in your classroom but not sure where to start? 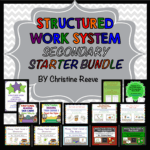 Check out my Structured Work Starter Kits and Bundles in my store. 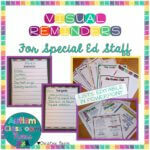 Great post and really good information to share especially with new special ed teachers. Thanks for the insight.